This species is accepted, and its native range is E. Tropical Africa to Malawi. Terrestrial, epiphyte or rarely lithophyte. Rhizome erect, fleshy, to 60 mm long and 8–50 mm diameter, with pale to mid-brown ovate acute subentire rhizome scales to 9–14 × 3–3.5 mm. Fronds tufted, erect to arching, not proliferous, thinly to thickly coriaceous. Stipe pale brown to greyish-green when dry (green to black when fresh), 15–48 cm long, glabrous except for some scales near base. Lamina dark green, narrowly ovate in outline, 32–80 × 13–26 cm, 2-pinnatisect to 3-pinnatifid on the lowermost pinnules, with basal pinnae reduced (rarely not reduced), apex gradually decrescent. Pinna opposite or alternate, 23–44 pairs, oblong and attenuate, the largest (6–)8–13(–16) × 1–2.2 cm or up to 4 cm wide with much-lobed basal pinnules, petiolate, deeply pinnatifid into linear or very narrowly spatulate segments set at 45°, 1–2 mm wide, most segments entire or some with bifid apex or many segments bifid, basal acroscopic segment usually more lobed or enlarged to an up to 2.5 cm long deeply lobed pinnule (rarely basiscopic segment also more lobed), apices acute or obtuse; more basal pinnae often shorter and with more widely winged costa and so appearing more pinnatipartite than the pinnatisect upper pinnae; with scattered scales similar to those on rachis. Rachis black and green when fresh, pale brown when dry, with scattered dark brown narrowly lanceolate scales to 3 mm long with hair-like lobes, sometimes becoming glabrous. Sori 1 per pinna lobe, ellipsoid, borne halfway along the length of the lobe but almost on the margin, facing towards the pinna apex, 1.5–5(–6) mm long. Indusium very narrowly oblong, membranous, entire, to 1 mm wide. Fig. 9: 7–8, p. 54. 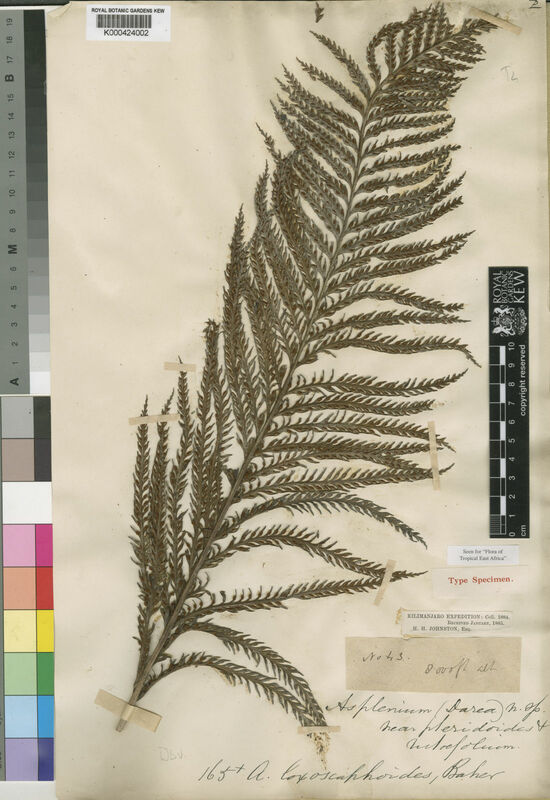 Baker in his protologue said the taxon was close to A. rutifolium; the characters he uses in the description are similar to those of rutifolium, except for ‘lower pinnae 10–12.5 cm long, 10–12 mm wide’ – which is larger than in rutifolium. The type (and only specimen Baker saw) does not have a stipe & rhizome. Baker did not mention how he thought the plant differed from rutifolium. I believe there are some differences, as per the key (rhizome scales being the most clear; plus some relative sizes) but the two taxa are close, and there are some vexing overlap characters/specimens (see note under A. rutifolium). Asplenium centrafricanum Pic.Serm. in Webbia 27: 436 (1972 publ. 1973) from Burundi, Zaire is probably the same; the differences enumerated in the protologue do not sound very different to me. U.K.W.F. ed. 2: 29, t. 173 (1994).